Shaker cups have become quite popular and you go to the gym, you are likely to see someone drinking from one of them. 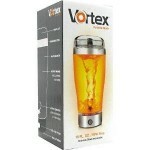 They feature a wired ball that can help to mix the drink. These bottles are convenient and are ideal for protein shakes, juices and other drinks loved by fitness fanatics. However, the metal balls may accumulate what is left of a drink over time. That is why many people are opting for electric shaker cups. The advantage of electric shaker cups is that they can mix the ingredients better than a regular shaker, ensuring that you get all the benefits from your healthy drinks. Most electric shaker bottles work by creating a funnel within the bottom of the bottle to slowly combine the ingredients to get more even results. The cup will continue mixing the ingredients until you turn it off. You won’t need to worry about rests of ingredients getting stuck to the bottom of the bottle. While the potential of electric shaker cups is only starting to become noticed by a wider group of manufacturers, it is possible to find good options at the moment. These convenient portable shaker bottles can be used to mix your drinks on the go. Here is a selection of electric shaker cups that are ideal companions for your workout. This electric shaker offers powerful performance for a mixer of its kind and can be used to mix all kinds of liquids and even eggs. 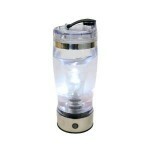 The bottle is BPA free, stainless steel and it features a motor that reaches 11,000 rpm motor. It works with two AAA batteries and can be used to handle hot drinks as well. If you are making a protein shake, make sure that you add the liquid first, followed by the powder. To prevent clumps of protein getting stuck at the bottom, make sure that you don’t add too many scoops of powder. This highly rated option can easily mix liquids and protein powders and it is available for a convenient price. It works with AAA batteries and saves you the hassle of having to shake your drink until you get the desired results. While it is not as powerful as a blender, it is important to keep in mind that it is designed to mix supplement drinks and not to make smoothies or juices from scratch. Its affordable and made out of clear acrylic\stainless steel construction. It must be washed by hand. This practical electric shaker features a non-slip component and an anti-spill lid. It is dishwasher safe and has a removable container for easier cleaning. The acrylic bottle can be used for both cold and hot drinks. The iTouchless LCM025 requires two AA batteries to work and it comes with an anti-spill lid. While it is more expensive than the other options in the list, it may be worth paying a little extra for the convenience that it offers. Cleaning up this bottle won’t be a hassle and its performance is good enough to mix your sports drinks. The above electric shakers offer a convenient solution to mix drinks on the go. Just keep in mind that they are not designed to handle pieces of fruit or to crush ice. 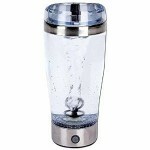 They don’t work as blenders and are only intended to help you to mix liquids or protein powders for your fitness drinks. While the iTouchless LMC025 is the most expensive bottle of the bunch, it is also the one that offers all the features that will ensure maximum convenience. It works well, has a larger capacity than the rest and it is easy to clean. This is important because it would save you time that you can dedicate to your workout.